The conference will take place in Bielefeld’s new research building (Campus Bielefeld). 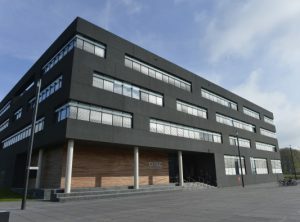 The CITEC Research Building has a lecture hall, rooms for workshops and a spacious foyer which is well suited for a poster session with more than 100 posters and at the same time provides space for catering. As an economic and cultural centre of Eastern Westphalia and with its population of 330,000 inhabitants, Bielefeld is one of the twenty major cities in Germany. Bielefeld‘s excellent infrastructure and its central location puts it within easy reach of all parts of Europe and the rest of the world. The nearest international airports are Hannover (110 km – ca. 1 hour by train), Paderborn (70 km – ca. 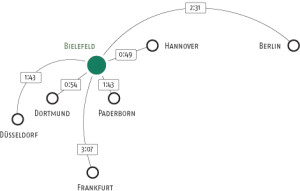 1 hour by car, shuttle service is possible), and Düsseldorf (190 km – ca. 1.5 hours by train). Düsseldorf, Frankfurt (320 km – ca. 3 hours by train), and Berlin (400 km – ca. 2.5 hours by train) offer many direct connections to international locations.